YEMEN (GaeaTimes.com) — Socotra island is considered to be a pristine paradise ideal for those who love adventure or simply to get away from the stress of the modern world. It belongs to the country of Yemen and is a situated 250 miles south of the Arabian Peninsula in the Indian Ocean. The island of Socotra is home to about 50,000 people, yet they get less than 200 tourists from the United States every year. The island is approximately 1,400 square miles in size, with some of the most incredible species of plants and animals in the entire world. Among the hidden treasures of the island are amazing yellow faced vultures and never before seen plants and flowers. These are part of the more than 800 endemic species of Socotra. 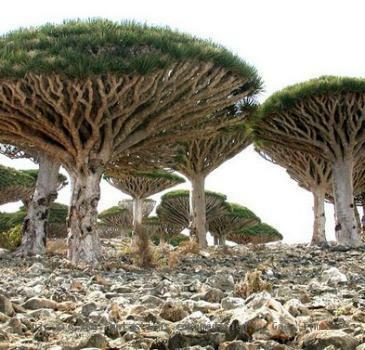 The island is most famous for its 5,000 Dragon’s Blood Trees, which reach up to sip moisture from the clouds. They were fought over in ancient times for their reddish looking sap, that was used for many purposes. It was used by Cleopatra to redden her lips, the Gladiators in Rome to heal wounds, and people on the island to color pottery. Whether it is the many different species of wildlife, or the beautiful untouched beaches with crystal blue water, Socotra is truly a piece of heaven on this earth. But now the question rises, why is the tourism in Socotra so weak? It is possible that people consider the region around Yemen to be a very dangerous place. Astonishingly, the Island of Socotra has only had 1 murder in the previous 10 years though. Last night TodayShow has featured Socotra on their new series entitled “Today’s Journey to Secret Kingdoms: Hidden Places Time Forgot”. It should be interesting to see if Socotra becomes a new destination for tourism after the national coverage they have received.